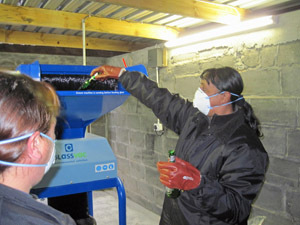 A crusher has been installed on Tristan da Cunha to recycle bottle glass for use as a filler for cement and concrete making. In 2011 the UK Government, through the Department for International Development, allocated funds to the Overseas Territories to improve their waste management, and preserve their natural resources and heritage against human destruction. Sean Burns the Island Administrator gave the task to the Tourism Department to research and purchase a suitable Glass Crusher for the Island. A Company called Krysterline was contacted and lots of emails exchanged hands to ensure a crusher was found suitable for Tristan’s needs. 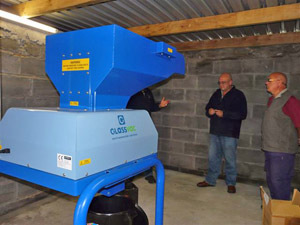 The GP3 Glass Imploder was then purchased and arrived at the island in February 2012 after many months of planning. Recycling is totally new to Tristan, so in April, flyers were sent out to all the community to raise awareness and to explain how the collection of glass would take place. 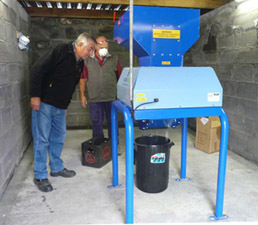 At this time an old shed was revamped and the Glass Recycler was moved in. 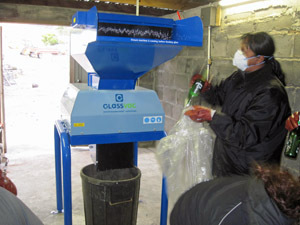 Clear plastic bags were delivered to all households for glass along with the black bags for normal refuse. These bags will be collected on Wednesdays, with black bags going to the dumpsite and clear bags going to the Glass Recycling Shed. 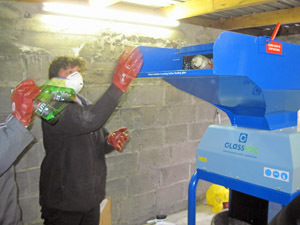 On Tuesday 15th May the Glass Recycler was tried and tested. Present were Kobus Potgieter Acting Administrator, Dave Hendrikse Director of PWD and Stan Swain Team Leader of the Electrical and Plumbing Department. On Wednesday 16 th May the first community collection took place and all glass collected will be recycled by the refuse removal team. 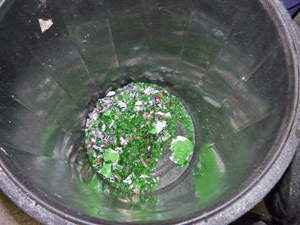 Once crushed, the glass will be used in concrete as an alternative to sand. 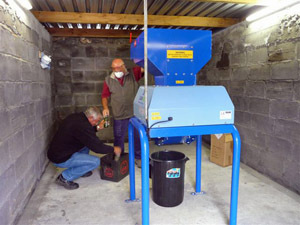 The community are so eager to go green it is hoped to purchase a metal compactor in the next few months. 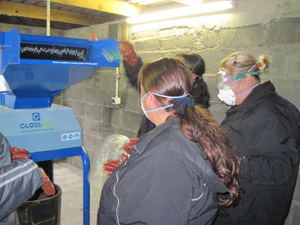 Above ~ Left: Jenny Green ~ Right: Glynis Swain getting to grips with the new glass recycling project aiming to cut down waste and provide valuable material to improve cement and concrete making which relied on poor quality beach sand.